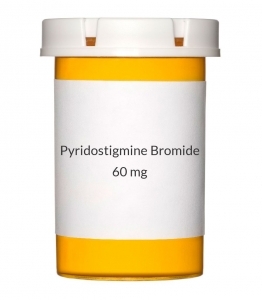 USES: Pyridostigmine is used to improve muscle strength in patients with a certain muscle disease (myasthenia gravis). It works by preventing the breakdown of a certain natural substance (acetylcholine) in your body. Acetylcholine is needed for normal muscle function. HOW TO USE: Take the regular-release tablet or liquid form of this medication by mouth with or without food as directed by your doctor. If taking the liquid, use a medication-measuring spoon or device to make sure you get the correct dose. Do not use a household spoon. Take the extended-release tablet by mouth with or without food, usually 1 to 2 times daily (at least 6 hours apart) or as directed by your doctor. Do not crush or chew extended-release tablets. Doing so can release all of the drug at once, increasing the risk of side effects. Also, do not split the tablets unless they have a score line and your doctor or pharmacist tells you to do so. Swallow the whole or split tablet without crushing or chewing. Taking this medication with food or milk may help to decrease side effects. Dosage is based on your medical condition and response to therapy. Talk with your doctor about how you respond to the medication and about when you feel the most tired or weak so that your doctor can make the proper dosage changes. Do not increase your dose or take this medication more often than prescribed. Doing so may increase the risk of serious side effects. The tablet forms of this medication may become discolored due to moisture. This does not affect how well the medication works. Tell your doctor if your condition persists or worsens or if the medication stops working well. SIDE EFFECTS: Nausea, vomiting, diarrhea, abdominal cramps, increased saliva/mucus, decreased pupil size, increased urination, or increased sweating may occur. If any of these effects persist or worsen, tell your doctor or pharmacist promptly. Remember that your doctor has prescribed this medication because he or she has judged that the benefit to you is greater than the risk of side effects. Many people using this medication do not have serious side effects. Tell your doctor immediately if any of these unlikely but serious side effects occur: new or increased muscle cramps/weakness/twitching, shortness of breath, new or increased difficulty swallowing, slow heartbeat, dizziness, headache. A very serious allergic reaction to this drug is rare. However, seek immediate medical attention if you notice any symptoms of a serious allergic reaction, including: rash, itching/swelling (especially of the face/tongue/throat), severe dizziness, trouble breathing. This is not a complete list of possible side effects. If you notice other effects not listed above, contact your doctor or pharmacist. In the US - Call your doctor for medical advice about side effects. You may report side effects to FDA at 1-800-FDA-1088. In Canada - Call your doctor for medical advice about side effects. You may report side effects to Health Canada at 1-866-234-2345. PRECAUTIONS: Before taking pyridostigmine, tell your doctor or pharmacist if you are allergic to it; or to other anticholinesterase medications (e.g., neostigmine); or to bromides; or if you have any other allergies. This product may contain inactive ingredients, which can cause allergic reactions or other problems. Talk to your pharmacist for more details. This medication should not be used if you have certain medical conditions. Before using this medicine, consult your doctor or pharmacist if you have: stomach/intestinal blockage, urinary blockage. Before using this medication, tell your doctor or pharmacist your medical history, especially of: lung disease (e.g., asthma, chronic obstructive pulmonary disease-COPD), kidney disease, slow/irregular heartbeat. Before having surgery, tell your doctor or dentist that you are using this medication. The liquid form of this product contains sugar and/or alcohol. Caution is advised if you have diabetes, alcohol dependence, or liver disease. Ask your doctor or pharmacist about using this product safely. Kidney function declines as you grow older. This medication is removed by the kidneys. Therefore, elderly people may be at greater risk for side effects while using this drug. During pregnancy, this medication should be used only when clearly needed. Discuss the risks and benefits with your doctor. It is not known whether this medication passes into breast milk. Consult your doctor before breast-feeding. DRUG INTERACTIONS: Your doctor or pharmacist may already be aware of any possible drug interactions and may be monitoring you for them. Do not start, stop, or change the dosage of any medicine before checking with your doctor or pharmacist first. Before using this medication, tell your doctor or pharmacist of all prescription and nonprescription/herbal products you may use, especially of: aminoglycoside antibiotics (e.g., gentamicin), antiarrhythmic medications (e.g., quinidine), anticholinesterase eye medications (e.g., physostigmine), beta blockers (e.g., timolol, propranolol), mefloquine, narcotic pain medications (e.g., morphine, codeine). This document does not contain all possible interactions. Therefore, before using this product, tell your doctor or pharmacist of all the products you use. Keep a list of all your medications with you, and share the list with your doctor and pharmacist. OVERDOSE: If overdose is suspected, contact your local poison control center or emergency room immediately. US residents can call the US National Poison Hotline at 1-800-222-1222. Canada residents can call a provincial poison control center. Symptoms of overdose may include: nausea, vomiting, diarrhea, greatly increased saliva/sweat/tears, blurred vision, fast/slow heartbeat, confusion, agitation, muscle cramps/weakness, inability to move, trouble breathing, loss of consciousness. STORAGE: Store at room temperature at 59-86 degrees F (15-30 degrees C) away from light and moisture. Do not store in the bathroom. Keep all medicines away from children and pets. Do not flush medications down the toilet or pour them into a drain unless instructed to do so. Properly discard this product when it is expired or no longer needed. Consult your pharmacist or local waste disposal company for more details about how to safely discard your product.